NEBA is the first of a new kind of medical device cleared by FDA that uses brainwaves (EEG) to help clinicians more accurately diagnosis ADHD in children and adolescents (ages 6 – 17.99 years). NEBA helps clinicians determine if symptoms are due to ADHD or some other condition. NEBA measures the electrical activity in the front part of the brain to derive a biomarker. NEBA then combines this information with the clinician’s diagnostic impression. Our FDA validation study (available from FDA’s website) showed that NEBA’s categorization can help clinicians reduce over-diagnosis of ADHD to as low as 3%. See MRK0080/2015.03.25. NEBA is only available through licensed clinicians by prescription. Initial order covers NEBA account setup, NEBA equipment setup, and shipping. Our credentialing specialist will contact you after the order to validate appropriate licenses, to schedule technician and clinician training, and to complete required paperwork. If you do not qualify per the FDA label as a NEBA provider we will refund your setup fee. Once you receive the NEBA equipment, NEBA Health charges a nominal monthly rental fee, cancel at any time. Patient or third party payer pays clinician and given the NEBA provider plan you choose may also pay NEBA Health directly for services rendered. USA Only. The NEBA is and should be seen as “the EKG” in the care, treatment and assessment of disruptive behavior in children and teens. Our field debates endlessly about the dearth of objective tools in the measuring of our children’s behavioral disturbances. We rely on scales, knowing they are prone to subjective whims; we rely on medication responses, knowing that response does not determine diagnosis; we complain of excessive neuropsychological testing and its costs but ignore the cost benefits of this straightforward test. Nebahealth is among the most intelligent and most ethical mental health organizations I have ever worked with. They are actually here to help patients. The machine and its assays are contributing to science and good medicine. Very helpful and groundbreaking science! NEBA has been extraordinarily helpful for our practice. It provides both clinicians and patients with improved diagnostic accuracy as well as peace of mind. The company has been professional, efficient, and responsive to both us and our patient’s needs. Highly recommended! Paper-based evaluations for adhd are not adequate especially when science today classifies adhd as a medical condition. Objective testing is the way of the future. NEBA is a helpful tool to increase accuracy of diagnosis and improve quality of care. I have been using NEBA Health ADHD Device since 2013. After conducting 300+ procedures, I cannot imagine going back to “opinion based” diagnoses and not use this ADHD Biomarker. NEBA ADHD Brainwave device is an essential tool that any busy clinician can utilize and add more confidence in behavioral diagnoses or prescribing ADHD stimulants/controlled meds. Support is excellent and there are no long term contracts to worry about. I would highly recommend this device. We like NEBA health testing machine it gives us the information we need for the patient’s that believe they have ADHD/ADD. the machine is easy to use and is done in the office we get results within 48 hours of testing. Recommend that if any office that would like to know if there patient’s really have ADD/ADHD or if it could be some other psychiatric disorder. Learn more about the research and studies NEBA Health has completed regarding NEBA and ADHD. NEBA is the first of a new kind of medical device cleared by the FDA that uses brainwaves (EEG) to help clinicians more accurately diagnose ADHD in children and adolescents (ages 6 – 17.99 years). FDA created an entirely new category of medical device to regulate NEBA. These devices are called Neuropsychiatric Interpretive EEG-based Assessment Aids or NIEAs for short. Our FDA validation study (available from FDA’s website) showed that NEBA’s categorization can help clinicians reduce overdiagnosis of ADHD to as low as 3%. What do other parents think about NEBA? Parents report that NEBA provided them the help they were looking for and that they would recommend NEBA to other parents. You can find our most recent parent survey results, here. You can also see videos of parents telling how NEBA helped their children and their families, here. NEBA is an accurate, quick, and insightful way to help clinicians and parents make better decisions about ADHD. Some third party payers do cover NEBA. There are thousands of payers in the United States. Each has its own payment policies. Learn more here. We can help you check your benefits to see if coverage is likely. Call (888)539-4267 for NEBA Benefit Services. Do NEBA providers take insurance? It depends on the particular policies of a practice: some take insurance, and some providers are fee-for-services practices. How much does NEBA Cost? It depends. The total out-of-pocket for NEBA will never be more than $425 and your out-of-pocket cost will likely be significantly less. Why? Your out-of-pocket depends on your particular insurance provider and policy. NEBA’s cost varies by region. If you have a financial need, talk to your provider about NEBA-Cares™. For participating providers, NEBA-Cares may cover up to 100% of NEBA’s cost. NEBA-Cares is a program clinicians may use to provide need-based assistance for up to 100% of NEBA’s cost. Contact your NEBA provider prior to your NEBA procedure to see if they participate. Participating NEBA providers will give you a one page form to complete prior to the NEBA procedure. Where can I find a NEBA provider? Call 1.888.539.4267 and we will provide you with a list of all NEBA providers in your geographical area so you can decide the right clinician for your family. How do I get NEBA for my child? First, call us to find a provider and schedule an appointment. Second, get a NEBA prescription key code from the provider during your scheduling call. Third, sign up at MyNEBA. MyNEBA is our app that parents and caregivers use to register for NEBA. MyNEBA can be accessed by the web or by an app available in the Google store for Android devices. You enter your NEBA prescription key code and your billing, insurance and clinical information. MyNEBA then securely shares this information with your clinician. MyNEBA is HIPAA complaint and part of our ISO 13485 quality system. 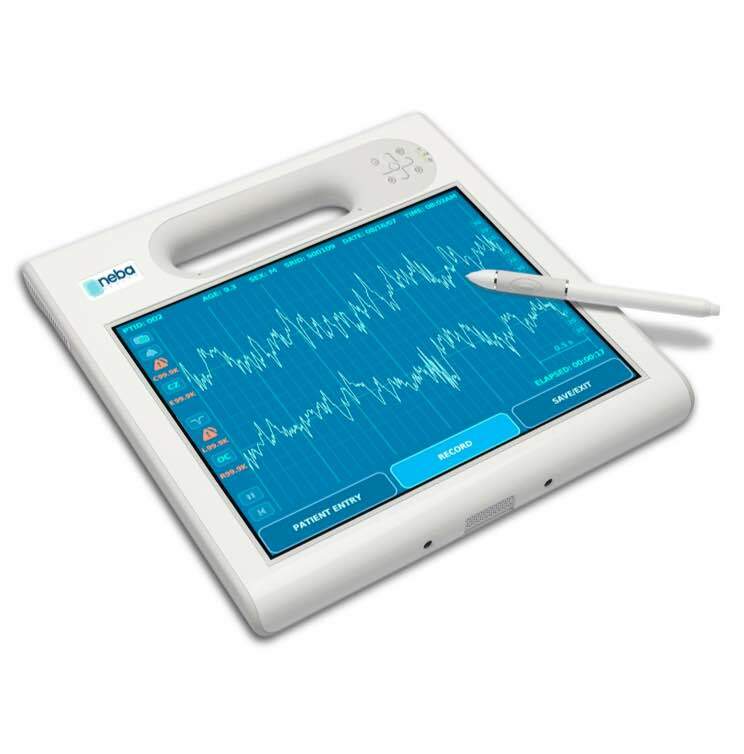 MyNEBA adheres to security standards for networked medical devices laid out by the FDA. You must have a NEBA Prescription Key Code to use MyNEBA. What is the NEBA Prescription Key Code? The NEBA Prescription Key Code is a secret code, given by the clinician that associates a patient with a particular NEBA provider. If you’ve lost your code you can call your clinician to obtain a new one. You can also call customer support. How long does NEBA take? NEBA takes about 15 – 20 minutes to administer. That includes setup and clean up times, and data collection. We usually process NEBA Reports within about an hour. Your clinician may schedule the NEBA process – initial diagnostic workup and impression, NEBA, clinical integration of results and parent/caregiver meeting — in one or several visits. How does NEBA practically work? Prior to NEBA test day, your clinician will instruct you and your child what to do. For example your child will be instructed to come to NEBA test day with clean hair with no braids. NEBA works by collecting brainwave data and processing it into a report. To collect the data, the NEBA equipment uses special disposable stick-on electrodes. A special electrode is used on the top of the head – it doesn’t have adhesive on it and it’s held in place by an elastic band. The electrodes are non-invasive, that is they rest on the skin’s surface. The NEBA technician gently removes the electrodes after use. Is NEBA available outside the United States? NEBA is cleared for marketing in the United States. We are licensed by Health Canada. NEBA is currently available only in the US. Is NEBA in the Media? Psychology Today: Diagnosing ADHD by brainwaves? Psychology Today: To test or not to test? Who is NEBA Health, LLC? NEBA Health is a small company passionately helping clinicians, children and families with tools that aid in assessing mental health disorders. We are an ISO13485 medical device manufacturer with an FDA facility in Boulder, Colorado and corporate offices in Augusta, Georgia. We operate a registered HIPAA compliant NIEA physiological laboratory. We are a member of AdvaMed and support the AdvaMed Code of Ethics. NEBA Health, LLC is privately held.